Another great benefit is the fight against what we call "brain fog." You know the feeling. When you're a few hours into your event or training run and you have trouble doing basic math, or calculating your pace, etc... MCT oil is a fantastic cognitive aid. In fact, it's used in Alzheimer's patience for those cognitive benefits. We saw a great deal of positive effects once we added this ingredient to our formula, especially after several hours of activity. Last, but not least, this oil greatly improves the texture of the gel. 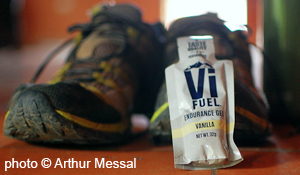 People can definitely see a difference in the viscosity of VFuel, especially when compared to our caloric density. We can offer a more palatable (texture wise) gel and still get the higher calorie count. Now, when you start digging into MCT oil on your own, you will see research all over the spectrum on the effects this oil has on the typical athlete. Some studies show that it has no effect, while other show some large benefits even for your average athlete. Again, we use the tests and the science as a starting point, a baseline, when formulating our products. The rest of the data we collect in our own field tests and studies. How does it ACTUALLY perform, across the board, during, a 100 mile run? During a training run? During a 5k? For example, this ingredient was tested extensively at the Leadville 100 and at Rocky Raccoon 100, in addition to countless long runs by ourselves and a number of beta testers. It was finally tested, with massive success, on training for and competing in the Hardrock 100 with the final formula. Granted, the benefits are more strongly felt and seen during longer events, but they do, most definitely, come out when using MCT oil in day to day training as well.